The Task Log view displays records of individual events that took place in a virtual data center. Tasks, which are not bound to a specific virtual data center (e.g. compute node related tasks) are always stored in the task log of the default main virtual data center. Time - Date and time of an event. Object - An object affected by the event. The column displays the object’s user-defined name (usually the alias attribute), as well as object’s unique identifier (usually the name or hostname attribute). Message - A qualified name of the event. User - An actual user who initiated the event. Detail - Task details, e.g. API function parameters, return values, detailed status messages, etc. Show only running tasks - Hide entries of tasks that have already finished. 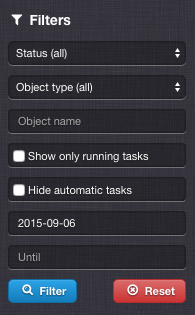 Hide automatic tasks - Hide entries of tasks that have been run automatically (e.g. automatic snapshots and backups). Date & Time - Limit output to task records created during specific period of time (since - until).